From director Christopher Nolan, 'Interstellar' movie arrives in theaters November 2014. The first teaser poster for Christopher Nolan's space epic "Interstellar" launched online Tuesday (May 6), with the clock ticking down toward the film's November 7 premiere. 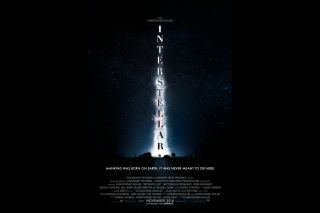 While little is known about the new film, the poster has revealed a tagline — "Mankind was born on Earth. It was never meant to die here." — that seems to play into what is known of the basic plot of the film. The new movie takes place in a future where NASA is all but dismantled. In order to save Earth, a group of explorers need to use a newly discovered wormhole to travel interstellar distances. "Interstellar" is partially based on the theories of Kip Thorne, an astrophysicist at the California Institute of Technology. The newly released poster shows two human figures standing below what look like the clouds of the Milky Way. Those galactic dust clouds appear to hint at the shape of a rocket, reaching up into the night sky. The ground below the glowing clouds looks like the farmland that appeared in "Interstellar's" official teaser trailer released last year. The shape of the truck actor Matthew McConaughey — who plays Cooper in the new film — drives in the trailer also seems to be silhouetted on the ground in the new poster. According to the Washington Post, a new trailer for "Interstellar" is currently playing at the Smithsonian's Air & Space Museum in Washington D.C., before films in the Lockheed Martin IMAX Theater. The museum will play host to the trailer at least until it premieres nationwide during showings of "Godzilla," which hits theaters May 16. You can read a full description of the new trailer on the Washington Post's website. McConaughey, Anne Hathaway, Jessica Chastain, Topher Grace, Michael Caine and others play roles in the film.